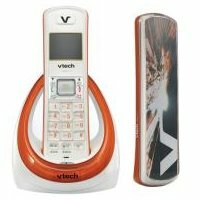 VTech has announced the retail and online availability of its latest phone systems, where the 2008 line up will feature the trend-setting LS6117 that spearheads VTech’s effort, touted to be the first cordless phone which is capable of delivering creative control over the phone’s aesthetics with customizable graphics. Other additions in the DECT 6.0 family are also stylish, providing the marriage of both form and function for your living room. According to Matt Ramage, senior vice president of product management, VTech Communications, “The 2008 lineup addresses what consumers want today — stylish designs with advanced technology features. Consumers want phones that fit their homes and lives, and that’s why we’ve added even more options for customization, expandability and organization, along with advanced technology for call clarity and interference reduction.” Do you think the man is right? The customizable LS6117 received inspiration from skateboard and snowboard designs, where the front features all the key functionality of a cordless phone while the back side makes a pretty strong design statement. The back of the handset can be altered to feature one of five special design inserts, or you can always print your own for a more personalized approach. As for the DECT 6.0 DS6121 digital expandable cordless phone, this cordless handset boasts a silver metallic finish and blue backlit keypad and display to fit in contemporary-designed rooms with ease. Alternatively, those looking for both convenience and flexibility can always settle for the triple-handset DS6121-3 and five-handset DS6121-5, which is similar in terms of features where the DS6121 is concerned. Those who are on a tighter budget can always check out VTech’s chic CS5121. This 5.8 GHz cordless phone system enables users to embrace the latest in cordless phone features, including a digital answering system, 20 name/number phonebook directory and caller ID/call waiting without breaking the bank. All you need ro fork out is a mere $25 – that ought to be affordable no matter what your station in life is.